Marketing and tourism are two crucial aspects of ensuring your winery becomes and remains profitable. But without creative, strategic marketing to get visitors to your website and tasting room, becoming or remaining a player in this hyper-competitive industry will continue to be a challenge for many small wineries. When it comes to marketing your winery, knowing where to start or how to stay ahead of the curve can be an overwhelming experience. Technology evolves rapidly, and trends emerge every year. Having to keep watch on the balance sheet day in and day out doesn’t help. With all the tasks that need to be handled – especially during harvest season – there is likely little time for you to spend on marketing. Luckily, there are a few recent trends that are relatively easy to follow and can produce big results. By leveraging the following trends, you can successfully promote your wine brand without having to put in a huge time investment. Start tailoring your brand messaging to your audience. Focus less on you, and more on the people who drink your wine. Features have become less important in selling a product; emotion will always have a place. Consumers today are tired of being “sold.” What people respond to today – what makes them adopt a brand as if it were their own child – is a passionate story that turns the brand into an experience that they can be a part of. If your story resonates with your audience and makes them say, “me too,” you’ve got yourself a loyal following. An amazing example of this is Nike’s Equality campaign. Note: “Story” here doesn’t refer to an origin story, like “We started with humble roots in Pop’s basement and acquired a vineyard in 1998.” Few people care about that. A good story is about your purpose, your promise, your authenticity. What’s your purpose? It shouldn’t be “to make the best tasting wines ever” – get more emotional than that. Your purpose should be something that any sane person, wine-drinker or not, can get behind. It doesn’t have to be about wine at all. Nike’s Equality campaign isn’t about shoes. It’s about something much bigger. What promise can you make to your consumers? Hopefully not “our wines will always taste good” – what about your ecological impact? What about the types of businesses you support in turn? Where are your materials sourced? What impact might you indirectly have on the life of the consumer? What do you believe in? Influencer marketing is blowing up right now, and for good reason. Invite wine and celebrity influencers to use and promote your brand. This can range from hosting a wine party for local radio hosts to paying for promotion by local influencers on Instagram or wine-bloggers. 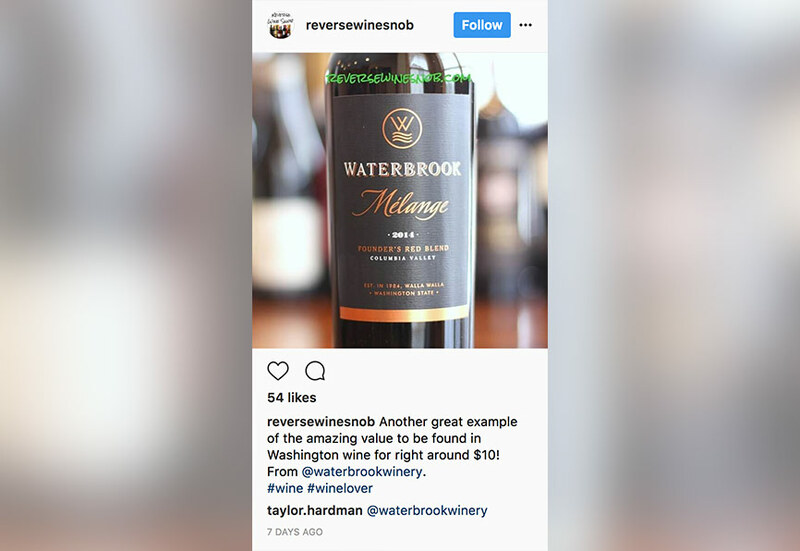 The easiest way to find an influencer is generally to just open up Instagram, look at some large wineries in your region and check out who’s following them and who they’re following. Chances are, you’ll find some local wine celebs or users with names like “winemom” and so on (we’ve seen, um, maybe a few too many of those). You could also try searching for specific, relevant phrases (#oregonwine, #pinotnoir, etc), make sure you’re looking at the results in the “Tags” tab. Pick a hashtag and check out some of the top posts – chances are you’ll find some from relevant influencers there. One thing – be sure you’re not picking someone TOO famous. Justin Timberlake might have a popular post with a wine in it, but that doesn’t mean he’s the right influencer for your business (and he’ll probably be a little too expensive, too).